This tiny mushroom is one of my favorites. I am fascinated by its "institious" stem base, which lacks basal mycelium and is directly inserted into the substrate (usually an oak leaf or a twig)--arising, seemingly, from nothing. 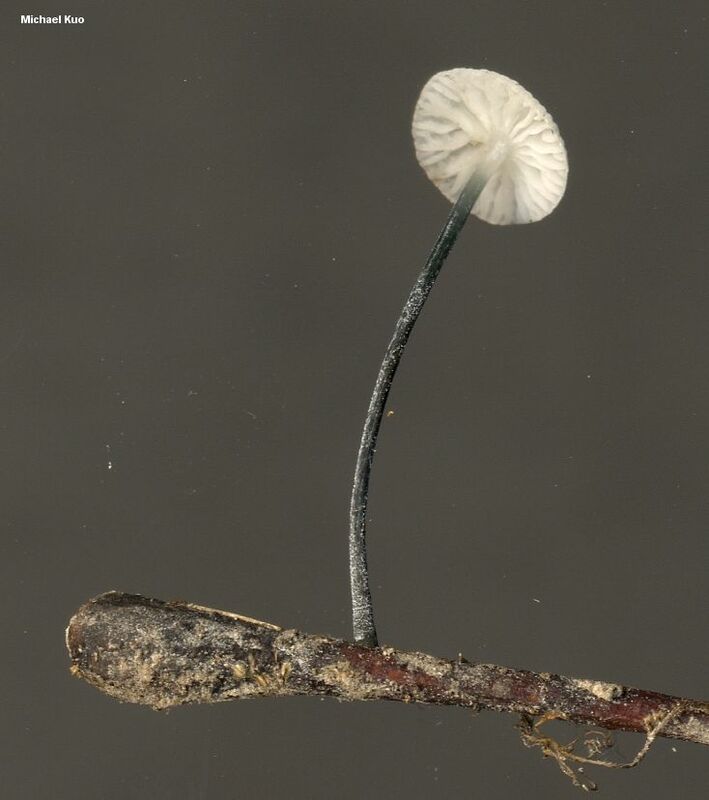 The stark contrast between the black stem and white cap of Tetrapyrgos nigripes is also striking. 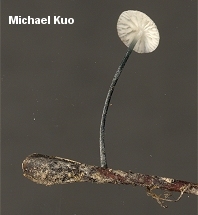 Other distinguishing features include the tiny white hairs on the stem, the rather flabby texture of the cap and gills, and distinctive microscopic features (see below). 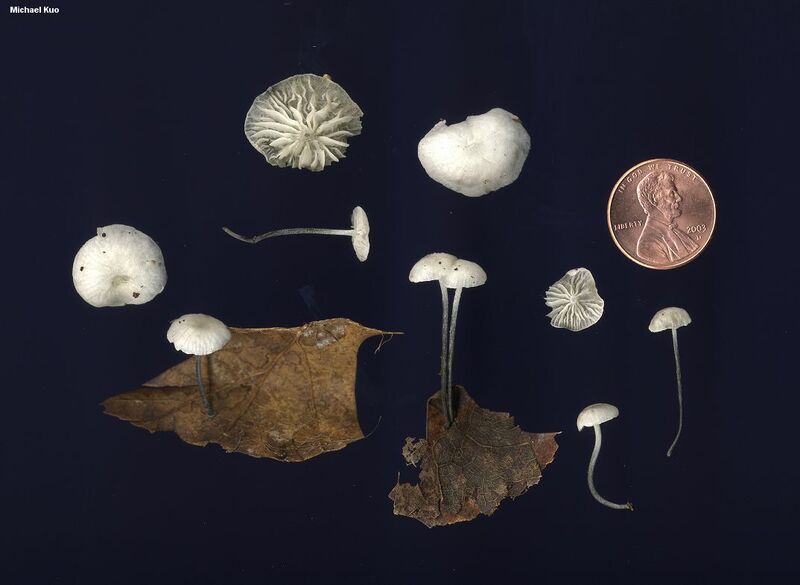 Compare Tetrapyrgos nigripes with Marasmiellus candidus, which has more distant gills, a different stem base, and very different microscopic features. Marasmiellus nigripes and Heliomyces nigripes are synonyms. Ecology: Saprobic on leaf litter and twigs in hardwood forests; growing alone or gregariously; summer and fall; widely distributed east of the Mississippi River. Cap: 0.5-2 cm across; convex, becoming flat; bald or finely dusted; becoming slightly wrinkled; white. 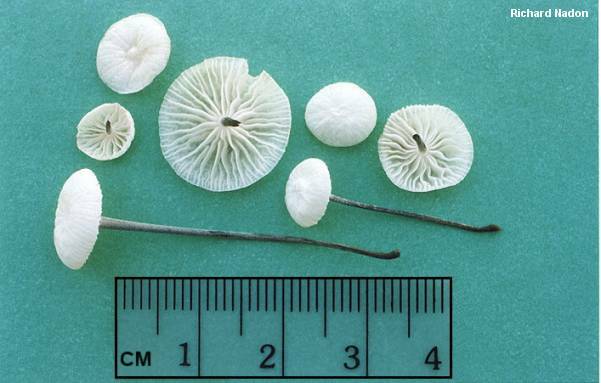 Gills: Attached to the stem or beginning to run down it; distant or nearly so; with cross-veins; white; sometimes discoloring reddish. 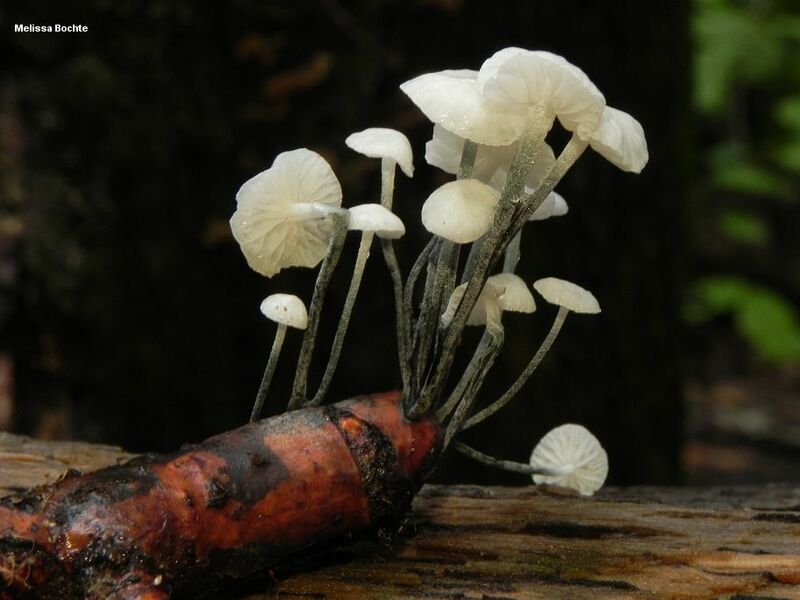 Stem: 2-5 cm long; less than 2 mm thick; equal; dry; straight; inserted directly into the substrate; tough; whitish when young but quickly becoming black from the base upwards; covered with tiny white hairs. Flesh: Thin; a little rubbery; whitish. 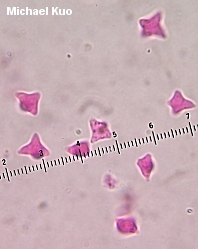 Microscopic Features: Spores 8-9 µ across at the widest point; smooth; 3- to 4- or 5-pointed (triangular or jack-shaped); inamyloid. Pleurocystidia absent. 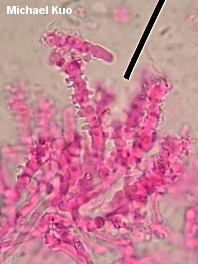 Cheilocystidia abundant; to 45 µ long; cylindric to clavate or irregular; diverticulate with numerous branches and fingerlike projections (often reminiscent of bottle brushes). Pileipellis a cutis, with terminal cells of two types: smooth, occasionally branched, lobed to fusiform or clavate elements; or clavate and diverticulate with numerous short, rodlike projections. REFERENCES: (Schweinitz, 1822) Horak, 1986. (Fries, 1838; Morgan, 1906; Kauffman, 1918; Singer, 1973; Phillips, 1991/2005; Lincoff, 1992; Barron, 1999; McNeil, 2006.) Herb. Kuo 06280702.